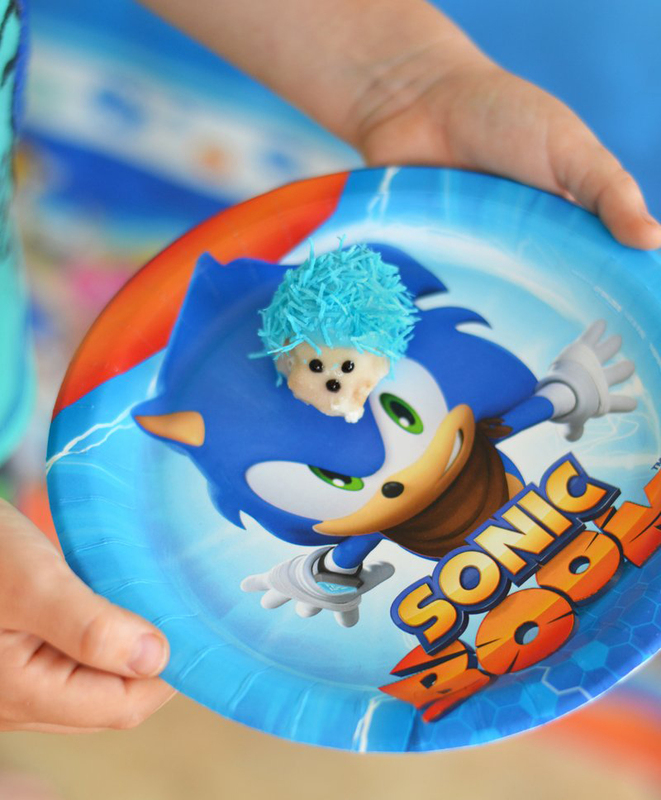 And click here for an alternate design for your Sonic Boom Party! Sonic the Hedgehog is almost 25 years old! It seems like yesterday that my sister and I would play Sonic on our Sega! Being that we played it as kids, I was really excited to be able to bring this theme to life as a party. 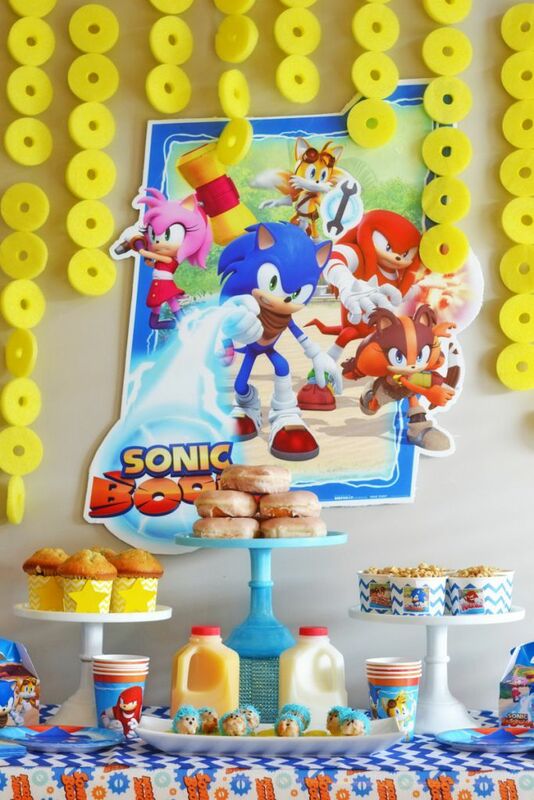 As I started brainstorming this theme, I was thinking about foods that you might be able to use as “golden rings.” If you have played Sonic, you know that Sonic collects gold rings in all his levels. It hit me that breakfast was the best part of the day to do food that is ring shaped! 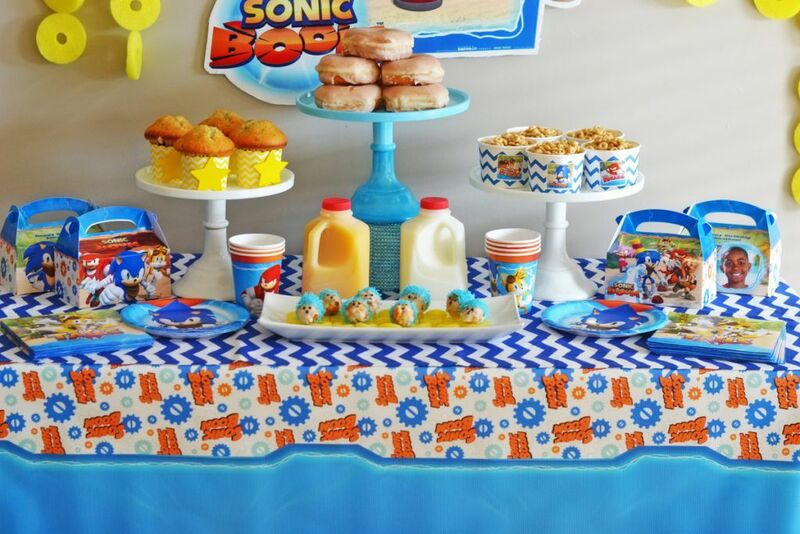 I have always wanted to do a breakfast party. 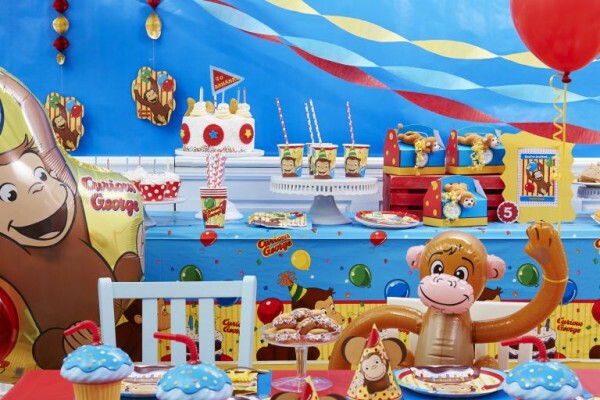 So many kids have sleepovers for their birthdays and how fun would it be to have them wake up to a fun breakfast with themed food and drinks? I think every kid would be delighted! I know I would! 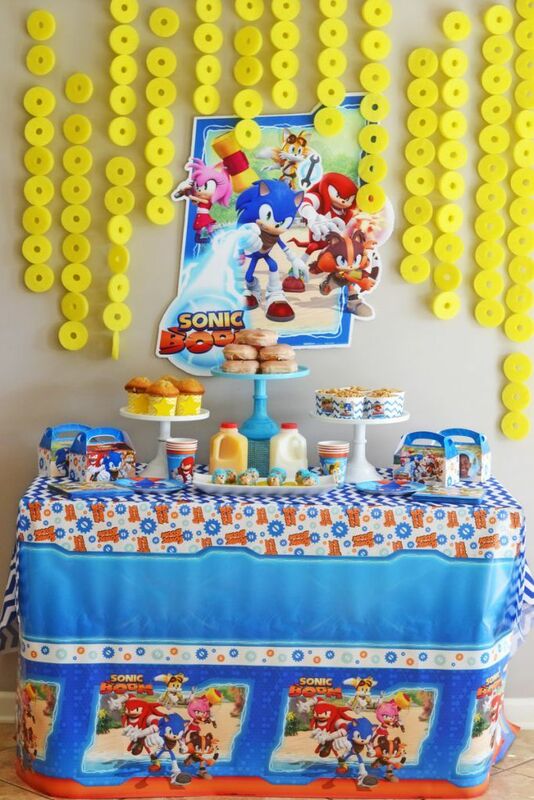 I started this theme with these fun Sonic themed party products from Birthday Express. 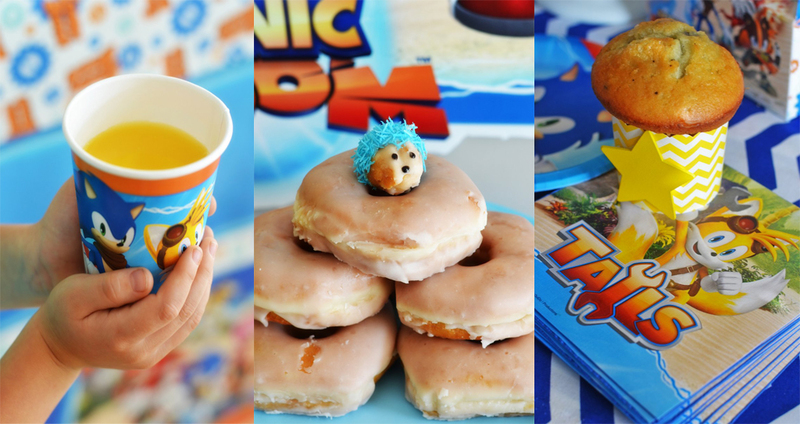 This Sonic Boom theme is a brand new collection to coincide with the new version of the game. I kept the décor minimal by taking one of the vinyl wall decals and putting it directly onto the wall behind a 4 foot table. Then, to bring in more of the “golden rings” I cut two large pool noodles into slices. Then, I strung them all together with fishing line and a large needle and I hung them from a dowel. 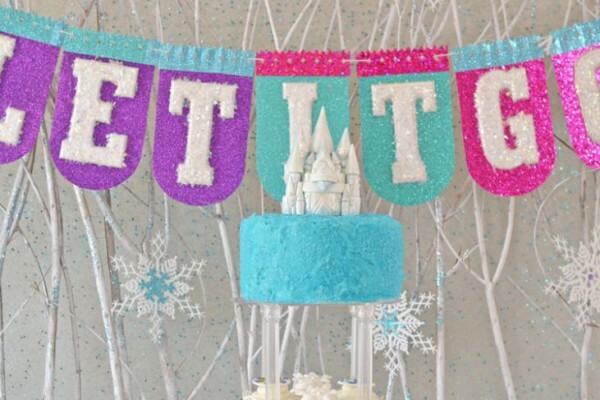 It’s an easy and inexpensive project that has a big impact at your party! 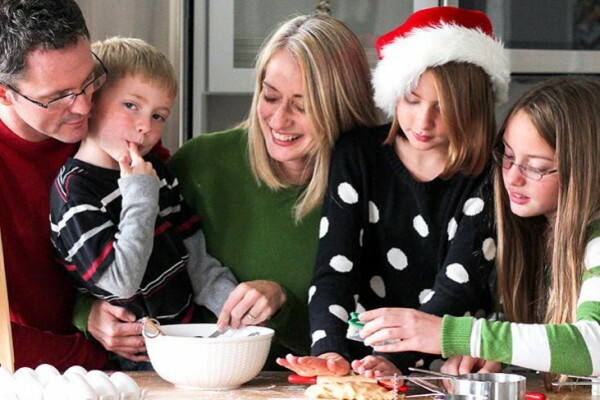 How many breakfast foods can you name that are shaped in a circle? Donuts, Cheerios, bagels, the list goes on and on! If you want to really keep going with this theme, you could even add pancakes and cut circles out of the middles of them! 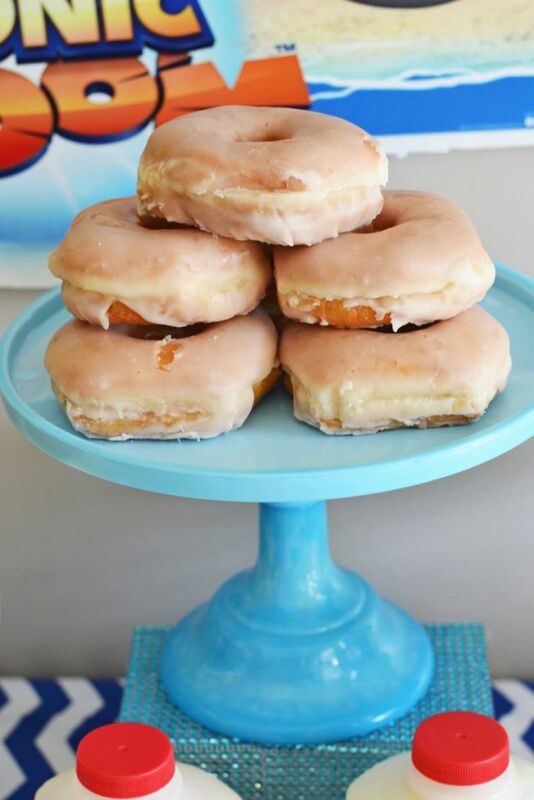 I knew instead of a cake, I wanted to do a stack of donuts. I picked up these glazed ones and displayed them on a blue stand. 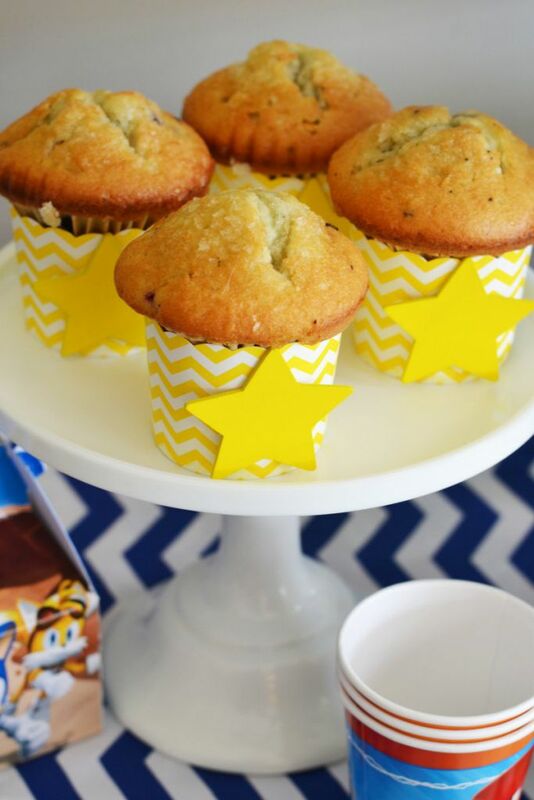 Then, I added blueberry muffins in these cute little yellow chevron liners. I added a yellow wooden star with some hot glue, just to dress it up a little bit. On the opposite side, I had to include Cheerios! I chose Honey Nut Cheerios for the real gold color. 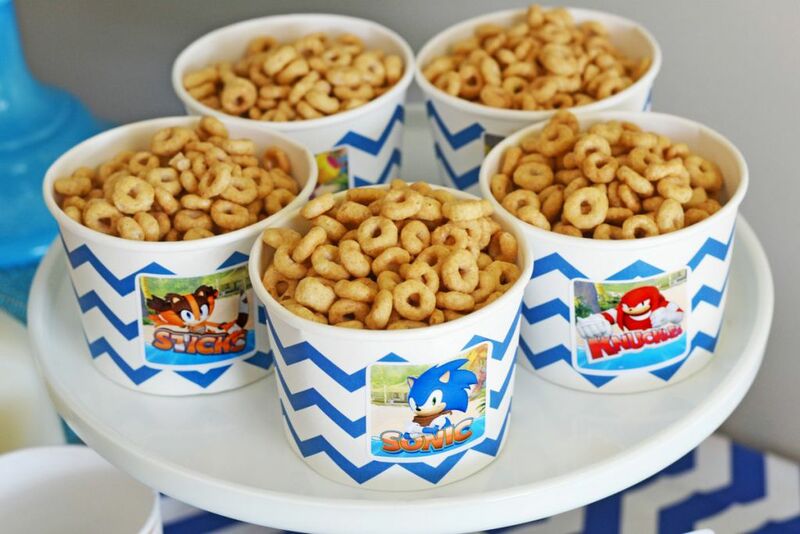 I got these cute little blue chevron cups at a discount store and I added some stickers from the party collection to give them a little extra Sonic feel. You have to have milk with your cereal and juice with your breakfast! 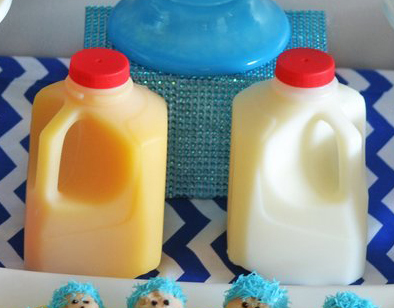 So, I found these cute little half-gallon jugs and filled them with the breakfast beverages. For the final touch, I had to make some little donut hedgehogs. So, I bought these donut holes and then blue candy melts, blue candy shred, and some black decorating gel. This is such an easy DIY. 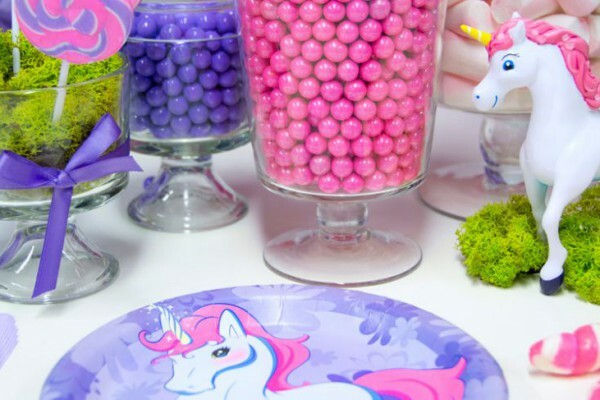 All you do is melt the candy melts in the microwave, dip the donut holes and while they are still wet sprinkle them with the candy shred. After they dry, you simply add eyes with the gel. 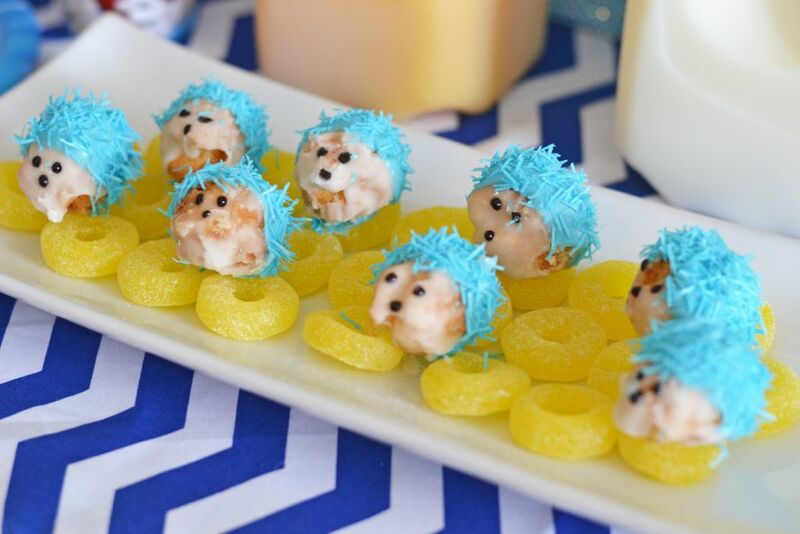 I found these gold gumdrop candy rings at a discount store and displayed the little hedgehogs on them. 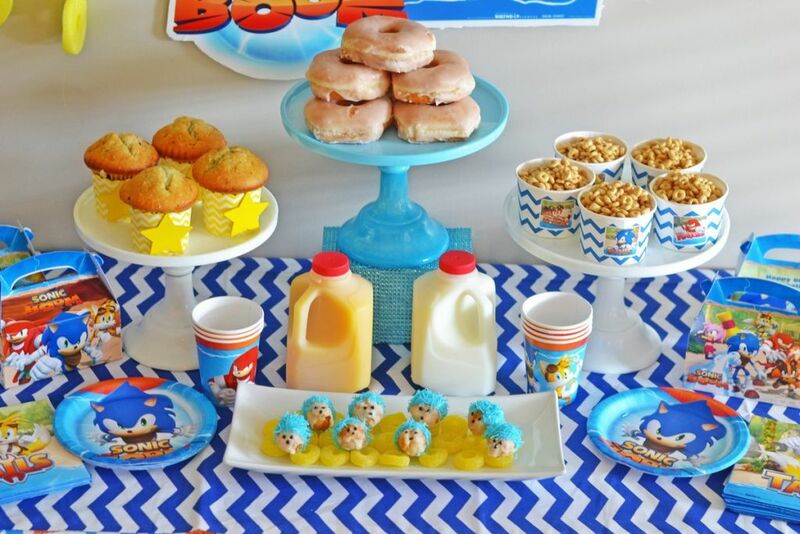 I love this breakfast party and I think your little guy would love it for his next sleepover too! 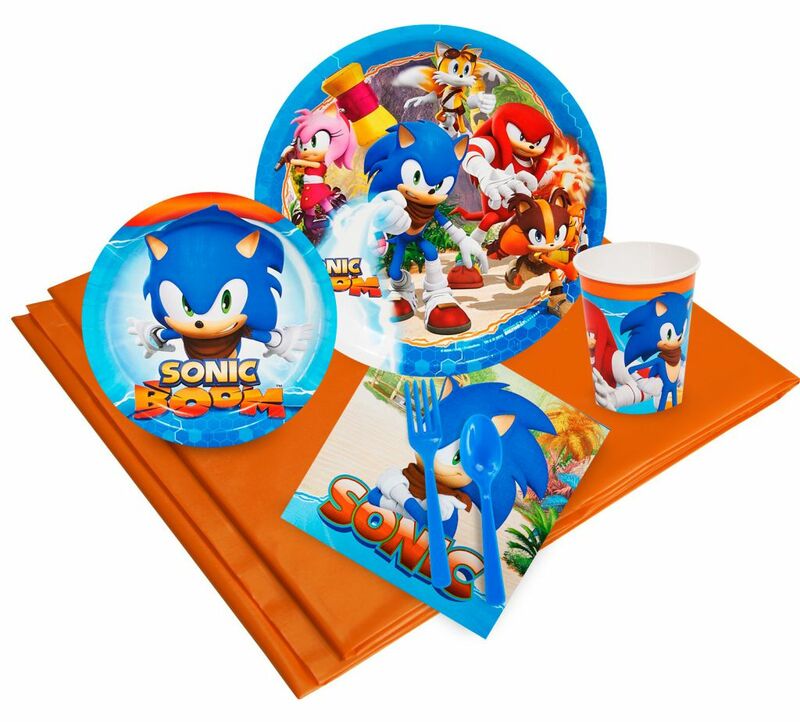 Click here to see all of the Sonic Boom party supplies available at BirthdayExpress!